Designed and created exclusively by CALLAHEAD, the Sink Basin® is our commercial grade portable sink. Whether you’re a construction site, garage, lumber yard, marina, nursery or cooking venue you will need a commercial grade sink for proper hygiene. 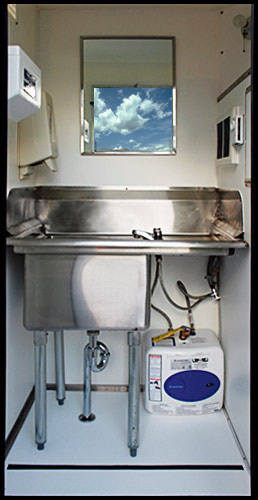 Our Sink Basin® is the first of its kind in the portable sanitation industry and was created for those heavy duty jobs that require a commercial quality sink when there is no running water. Standard with the Sink Basin® is Bosch’s Ariston electric tank water heater, a top name in water heaters which supplies the user both hot and cold running water. The Sink Basin® is a spacious portable unit enclosed with a large commercial grade stainless steel sink with Delta faucet, Go Jo hand cleaning dispenser, paper towel dispenser, stainless steel mirror, comfort zone thermostat and convenience shelves. Washing facilities are a requirement at job sites and locations where there is contact with solvents, concrete, fiberglass, asbestos and other hazardous materials since they can cause long-term illness. The Sink Basin® is not only durable but handles those tough cleaning jobs for proper hygiene. For decades CALLAHEAD Corporation has consistently created and developed new ways to answer our customer’s needs. So as requirements for washing facilities increase for those tough jobs, the Sink Basin® has been created and available only exclusively from CALLAHEAD Corporation. CallAHead Corporation at 1-800-634-2085 offers portable sinks and washbasins for rent when you want to offer a cleaner work environment for your construction site or special event. Callahead services all of New York City including NYC's five boroughs of Manhattan, Queens, Brooklyn, Bronx, Staten Island as well as Westchester county and Nassau and Suffolk counties on Long Island all the way to Montauk Point.